I'd update LJ more often if it actually worked. - I bet you think this blog is about you. I'd update LJ more often if it actually worked. 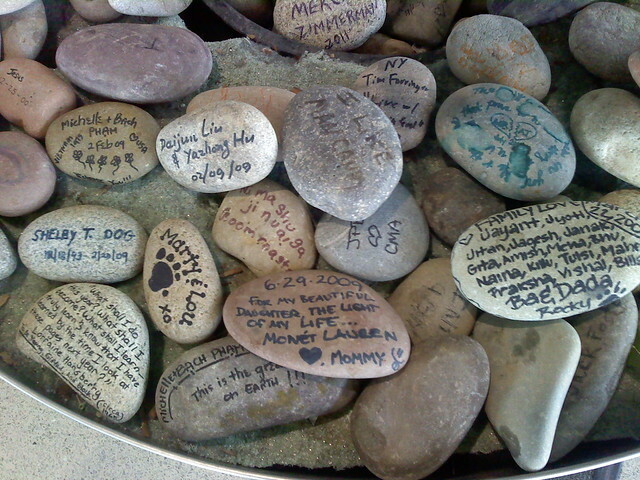 Bored travelers sign the rocks in planters at the Detroit Airport, for other bored travelers to read. I took a somewhat last-minute trip to DC over the weekend. I had booked myself on a 5:40 pm flight, but arrived at the airport by 2:00 in hopes of getting on a 2:59 flight and having a few extra hours in the District. Sadly due to a very full parking lot and a slow security line I didn't make that, so I wandered around the airport having margaritas and looking at the signed rocks in the planters. Not a bad place to spend a few hours, actually. When I'm next there on Friday I'm going to bring a Sharpie and do one myself. DC itself was swell. Friday night Brian and I ate delivered Italian food and then took a late grocery trip, then went to Cobalt for a while and tried to navigate the crowds with one less stairwell than usual. Saturday a bunch of folks came over, Brian made an assload of fried chicken and we day drank. That night the bf had to work so I arranged to go out with Tristan and Keith; our original plan of Nellie's was scrubbed by a huuuge line so we went to Green Lantern instead. Which was quite good anyway, because Shannon and Nate joined us, we had lots of good shots, and then we went to Tristan's for the afterparty. Where I passed out on his couch and had to be rescued by Brian at 4:00 a.m. Oops. Sunday we lazed around all day, then Pat drove us up to Quarry House with Aaron and we spent a couple of hours eating loaded tots and gossiping with Keith. Then went home, slept, and got up at 4:45 on Monday to make a 6:00 am flight. Which I almost missed because the very scattered guy in front of me couldn't fit his take-apart stroller through the X-ray. Gah. But I made it, and school has been happening since then. It's not all that exciting, except that Justin and I are going to drink the rest of the semester away on half-price martinis and probably Necto Fridays. Yesssss. And re: my next trip to the airport, I'll be in Boston Friday through Tuesday for the APA conference. Hooray 5,000 planners in one place. Updates from there will occur, if LJ will actually work.